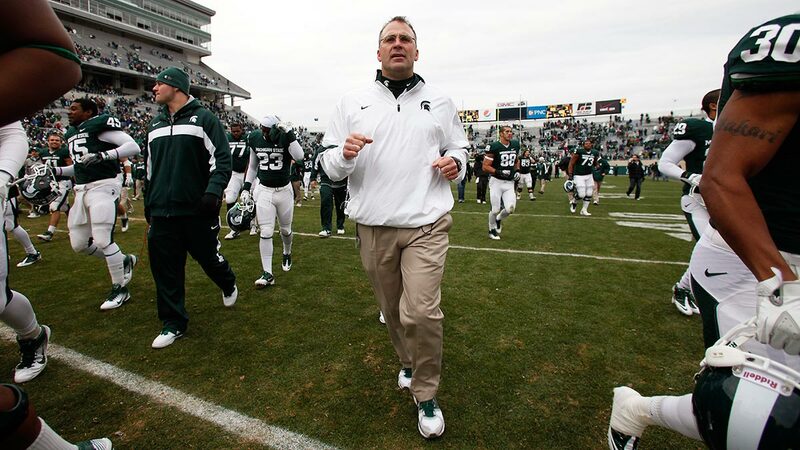 This Saturday, Michigan State heads to Oregon for a top-10 nonconference showdown. We know all about the Ducks’ innovative offense. How about the Spartans’ equally incredible defense? 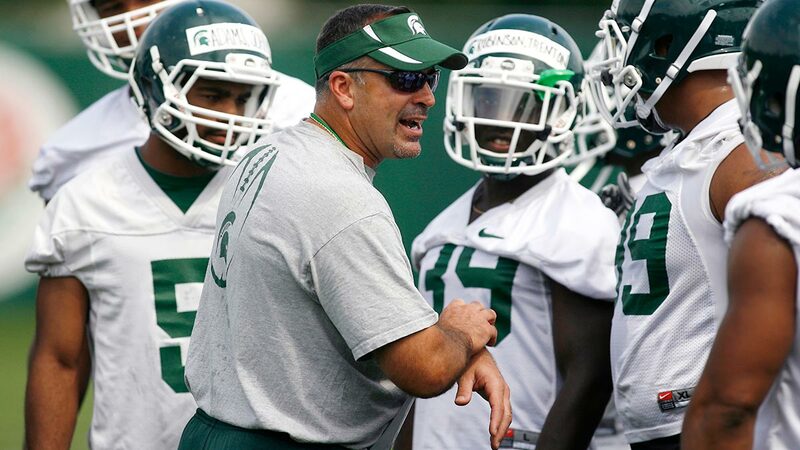 Mark Dantonio and Pat Narduzzi have shared a sideline for more than a decade, first at Cincinnati and now at Michigan State, and in the process they’ve forged one of college football’s great coaching pairings. In recent years the head coach and his defensive coordinator won the Big Ten title, returned the Spartans to the promised land of Pasadena, and accomplished something even more exceedingly rare: In the age of the wide-open offense, they’ve built a shutdown college defense. Along with defending champion Florida State, Michigan State is the only team to rank in the top five in defensive yards per play in each of the last three seasons, and the Spartans finished no. 1 last year while posting a 13-1 record. Even more remarkably, Dantonio and Narduzzi have built one of the best defenses in the sport without the benefit of the kind of blue-chip, future NFL talent that’s commonplace at schools like FSU, LSU, and Alabama. This Saturday, the MSU defense will face what could be its toughest challenge to date: a road game against the Oregon Ducks, whose entire identity stems from their up-tempo, no-huddle spread offense, and who routinely use a variety of reads, motions, and fakes to incinerate even the most talented defenses. Narduzzi and Dantonio won’t lack an edge of their own, though, thanks to their uniquely simple yet adaptable defensive scheme. Slowing tremendous quarterback Marcus Mariota and the Ducks will be a challenge, but it’s precisely the kind of challenge for which these Spartans were built. The paradox of the offensive explosion that’s swept college football in recent years is that, particularly when coupled with the no-huddle, offenses have actually enjoyed more success by getting simpler. Five hundred–page playbooks have given way to play-call sheets the size of Post-it notes, and, given the NCAA-mandated limits on practice time, the mantra has been that fewer plays rehearsed more often will defeat just about anything a defense can think up — so long as the quarterback makes the right read. Just by lining up, modern spread offenses pose three threats on essentially every play. First, each of a team’s multiple receivers is a threat to streak straight downfield in the form of “four verticals,”1 which puts tremendous strain on the defense by outnumbering traditional two-deep and three-deep zones. Second, those receivers can also crisscross and run underneath pick routes, which makes life difficult for defenders trying to play man-to-man coverage. And third, particularly if the quarterback is a threat to run, these offenses can still rush the ball. Defenses have individual answers to each of those tactics, but as the increased level of scoring around the country proves, defending all three at once is a tall order. Which also happens to be the best pass play in football. Rather than trying to call the right defense and maybe being right or maybe being wrong, Dantonio and Narduzzi have responded to this challenge by building a responsive defense that mutates into the right alignment depending on what the offense does. Against four vertical receivers, Michigan State wants four man-to-man defenders who can carry the receivers all the way upfield; against crisscrossing underneath receivers, the Spartans want to be in a zone coverage that lets their defenders break hard on the ball and on those receivers, rather than forcing them to chase in man-to-man; and against the run, the Spartans want as many as nine defenders in the box. How do they manage all that at once? Down after down, Michigan State lines up in what looks like the same basic, predictable front, with apparently the same coverage behind it: a “4-3 Over” front paired with “Quarters,” which is also known as “Cover 4.”2 The 4-3 Over is the oldest and most straightforward front in football, and it’s exactly what fans think of when they hear “4-3,” as it features four defensive linemen and three linebackers behind them. Quarters or Cover 4 coverage is a little trickier. While it’s a zone coverage, it doesn’t merely call for four defenders to drop to a deep zone, as the name might seem to imply. It’s played with considerably more nuance, particularly at Michigan State. Like Dantonio and Narduzzi, I use these two terms interchangeably. Quarters coverage, which has been around for a long time, is part of a family of “2-shell” coverages — bearing names like “Palms,” “2-Read,” and “Bronco” — that adapt to modern offenses on the fly and that have been sweeping across college and the NFL. Count on more about this from me at a later date. MSU’s scheme depends on the safeties, who have to make the most adjustments. They begin much closer to the line than most teams’ safeties, usually around eight or nine yards deep, and, numbering the offense’s eligible receivers from the outside in, they look through the no. 2 receiver to the offensive line for their initial keys. If the no. 2 receiver runs past that eight-ish yard mark, he belongs to the safety in what’s essentially man-to-man coverage. But if that receiver runs a short route inside or outside, the safety passes him off to the linebackers helping underneath and becomes a “robber” player, keying the no. 1 receiver and the quarterback while trying to intercept any throws to the inside. If it’s a run play, however, the safeties join the four defensive linemen and three linebackers in stuffing the run. “Why Cover 4? We get nine men in the box,” Narduzzi said while explaining his coverage of choice in an instructional DVD. “People talk about, ‘Man, we’re in an eight-man front.’ Well, we’re in a nine-man front.” Getting that safety help against the run gives Michigan State’s linebackers flexibility rarely seen in other systems, and allows them to follow one overarching rule: see ball, get ball. There’s a reason the Spartans’ rushing defense has ranked in the top 10 nationally each of the last three seasons. Because it’s zone, the Spartans’ cornerbacks benefit from inside help from linebackers and safeties, and if the no. 1 receiver runs a short route, the corner will typically let him go and drop into a deep zone. In the above clip, Michigan State is showing a man-to-man blitz that causes the QB to throw the ball directly to a zone-dropping cornerback.4 A pass coverage that’s at once zone and man-to-man is hard for opposing QBs to decipher. Of course, many defenses that look great on paper have failed on the field, and for Michigan State’s adaptable Quarters scheme to succeed, every defender needs to make the same reads. And that’s precisely why the Spartans don’t run myriad defenses, instead preferring to master one highly sophisticated, flexible approach. For years, the zone blitzes Dantonio and Narduzzi ran were the traditional “fire zone” blitzes that every team used, with five blitzers and six defenders in coverage, arranged as three deep and three underneath. But in the last few years, Michigan State has heavily featured a tactic few other teams employ: a six-man blitz with five defenders in zone coverage. All-out, “Cover 0” man-to-man blitzes are used at every level, but they’re very risky, and Michigan State likes its blitzes safe. The answer, three deep zone defenders with two underneath, has overwhelmed opponents in recent years. The most famous six-man blitz Michigan State uses is the old “Double A” gap blitz, which sends two linebackers right up the middle on either side of the center. Even that, however, has an MSU twist: Dantonio and Narduzzi arrange their six rushers in a wide variety of ways, looping defensive tackles, crashing ends, and using linebackers and safeties off the edge. Playing only five defenders in pass coverage is meager, however, and the reason most teams play straight man-to-man behind a six-man rush is to account for all the eligible receivers. Michigan State solves this issue by having the two underneath defenders look to initially take away any “hot” or in-breaking routes that come into the seam area and then read the quarterback’s eyes. The key is not to have perfect pass coverage, but to have pass coverage that’s adequate enough while the quarterback is under extreme duress.5 By its own calculation, Michigan State blitzes on only around 30 percent of its defensive snaps, but because those blitzes are well timed and well disguised, they often leave the biggest wounds. If the tailback runs a swing route to either side, the outermost pass-rusher to that side will “peel” and cover the running back instead of rushing the QB, taking away another safety valve for the passer. 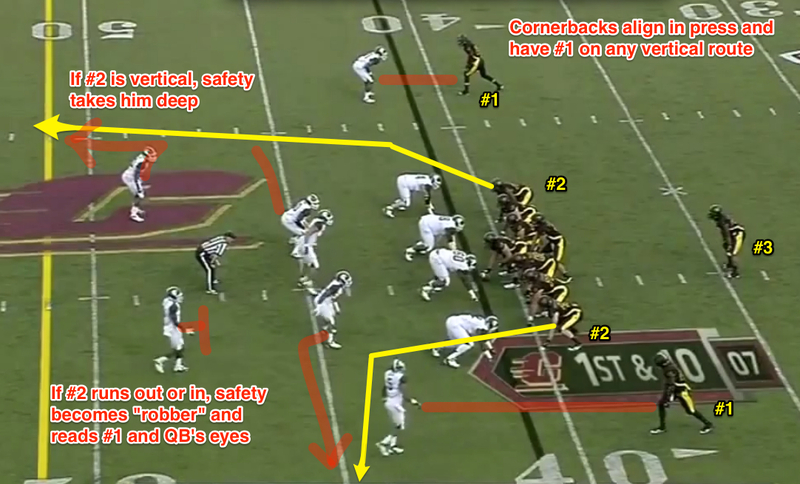 Against Oregon, all of Michigan State’s defensive principles will be tested. Mariota and the Ducks’ coaching staff have undoubtedly spent the summer devising ways to muddle the reads that Michigan State’s safeties, linebackers, and cornerbacks have to make. But that’s not going to scare the Spartans. Dantonio and Narduzzi have been doing this together for a decade-plus, and no matter the foe, they’ll play their brand of defense. What’s more, they know that great D isn’t the function of a magical scheme; it’s about mastering fundamentals and playing with discipline and effort. The scheme is there merely to channel the players’ energy and help them play fast and without hesitation. Right now, no defense in college football does that better than Michigan State’s. The Spartans have the scheme to take on the Ducks. They just need to execute.